Curiosity has made it to "Region e" of the Vera Rubin Ridge (VRR) campaign. This location is a slight depression with exposed fractured bedrock that appears more "blue" from orbit than the surrounding region. In addition, the orbital evidence and observations from the ground suggest that this location is similar to "Region 10" that we visited just last week, which was shown to have some pretty spectacular small-scale features that were of particular interest to many on the science team. As a result, the team was very excited to reach "Region e" and begin our scientific investigation! During the first day of this plan, Curiosity will focus on acquiring an incredible amount of high-resolution Mast Camera (Mastcam) color images of the area immediately in front of the rover, the "mid-range" region a few meters in front of the rover, and the entirety of Mt. Sharp. This is an anomalous amount of data to collect at a given time, but we are able to do so thanks to the help of the Mars Atmosphere and Volatile Evolution Mission (MAVEN) spacecraft, which will be helping us to downlink those images over the course of the next week. With the exception of the Mt. Sharp images, the other data are to characterize any small-scale geologic features present within "Region e," and the plan is to have these images back to Earth before Friday's planning session. In the afternoon of the first day, we will unfurl Curiosity's arm to characterize an unfractured piece of bedrock in front of the rover named "Unst." We will use the Dust Removal Tool (DRT) to remove any surface dust, image the patch of bedrock with the Mars Hand Lens Imager (MAHLI) instrument, and then place the Alpha Particle X-Ray Spectrometer (APXS) instrument on the target for an overnight integration to derive its bulk chemistry. On the second day of the plan, Curiosity will utilize its Chemistry & Camera (ChemCam) to remotely acquire chemistry data on two targets of interest. The first will be "Canna," a knobby piece of bedrock, and the second will be "Aberfoyle," the flattest portion of this blocky region in front of the rover. Aberfoyle will also be the target of an APXS measurement that evening. 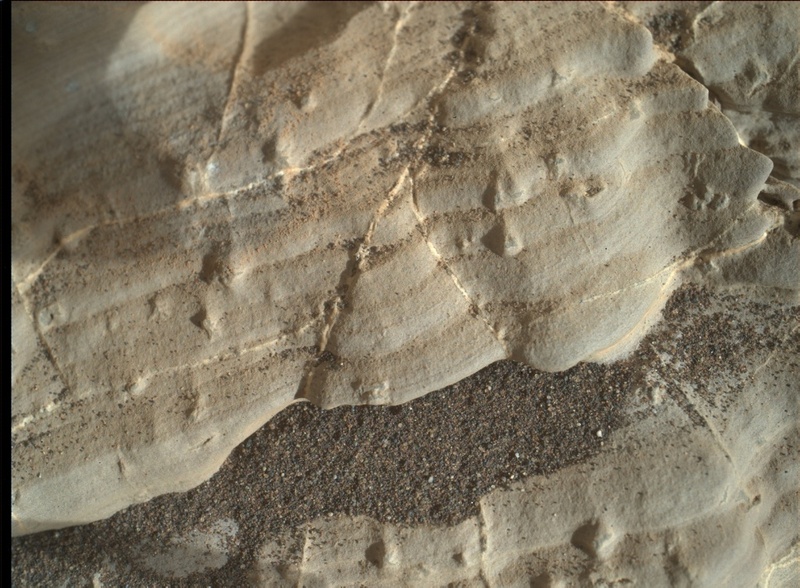 Mastcam will be used to document these targets, in addition to the automated ChemCam observation that was obtained two days earlier. The "Aberfoyle" ChemCam observation is beneficial for two reasons. First, we will be acquiring additional chemical measurements of this target that will be analyzed with APXS. Second, the laser blasts of ChemCam will help to remove any surface dust on the target, which will allow APXS to more confidently measure the bedrock composition with minimal input from the fine-grained dust. After this suite of measurements, the arm will then be moved into position to image the "Canna" target, the "Aberfoyle" target, and also a nearby layerred rock named "Funzie." After these images are acquired, the APXS instrument will be placed on "Aberfoyle" for an overnight integration. On the final day of the plan, ChemCam will analyze the chemistry of the "Unst" target (which was analyzed by APXS on the first evening of the plan), the "Funzie" target (to determine if there are any compositional variations associated with the observed layers), and a new target named "Morar," which is a piece of bedrock that shows some unique patterns that might be due to fracturing, the presence of veins, and/or sculpting by the wind. After the ChemCam observations, we will acquire Mastcam documentation images, and then make some environmental observations with Mastcam and Navcam to hunt for dust devils and to assess the amount of dust in the air.